The Eastern seaboard is under siege by a billion-bug swarm of cicadas—an entomological Red Dawn. This aggression will not stand! But why simply goosh them underfoot when you can make these insectoid invaders into a meal? Humans have consumed insects throughout history—Aristotle described the practice of eating cicadas back in the 4th century BC and the Iroquois people considered them a delicacy—and entomophagy continues today with nearly 3,000 ethnic groups eating everything from beetles and butterflies to ants, bees, wasps, and crickets. And, of course, Periodical Cicadas (of the Magicicada genus). Now, the idea of eating bugs might seem a bit off-putting but that's only until you realize that you've been doing it for years, just with different arthropods—namely shrimp, lobsters, and crawfish. Think of them as Land Shrimp if that helps. Cooking with cicadas is surprisingly easy. The swarms emerging in the Southeast and lower Midwest may number in the millions—per acre—but the insects themselves are big, dumb, and generally docile. The males' buzzing love song is loud enough to permanently damage your hearing but otherwise cicadas posses no natural defenses beyond their insane population densities. That's handy for opportunistic predators like us because it means that collecting the inch-long insects takes very little effort. Periodical Cicadas spend the first 17 years of their lives underground as larvae, feeding on the juices of tree roots and other plant matter. During emergence years, cicada nymphs will emerge after the soil reaches 64 degrees F. Once that happens, the insects will spend the next five weeks (the duration of their adult lives) trying to get laid. 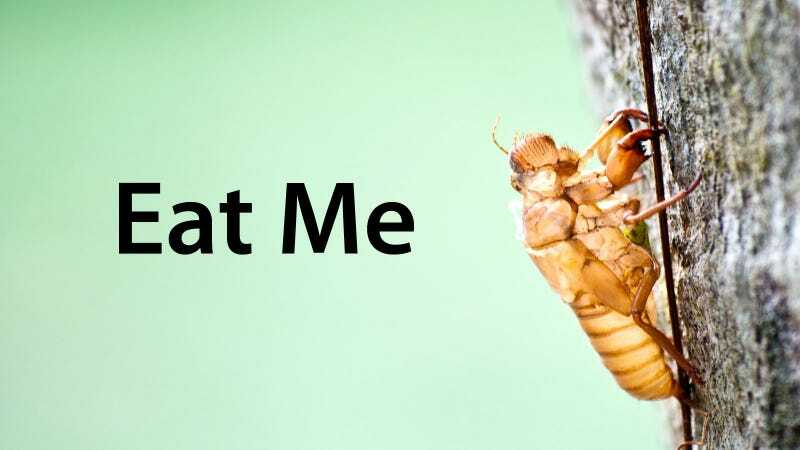 Cicadas tend to lay their eggs in oak, hickory, apple, and pear trees, though you shouldn't have much trouble finding them anyway. The best time to catch cicadas is in the early morning when the insects are still sluggish and have not yet climbed into the trees. Be on the lookout for freshly-hatched cicadas as their exoskeletons have yet to harden as well as females (they've got the pointy abdomens) since they're filled with fat and eggs. Males can be collected too but there isn't much meat to them. Simply dump the ones you collect into a paper bag. Once you've gotten your bag of bugs home, you'll need to blanch the insects before you prepare them further. Cicadas themselves are not known to conduct disease but flash boiling will kill off any soil bacteria on them as well as firm up the meat. To blanch, boil a pot of water and drop the insects in for about 5 minutes. After they're blanched, remove the wings, legs, and head. The cicadas can then be cooked further or frozen. Dry Roasted: Arrange the blanched cicadas in a single layer on a cookie sheet, salt and pepper to taste, and place it in a 225 degree oven for 10-15 minutes until the meat is dry to the touch. If the meat is still moist, put it back in the oven. You can also skewer and grill them like kebabs. The roasted cicadas can be eaten whole or coarsely ground into a powder for baking or as a nutty, meaty ice cream flavoring. Deep Fried: Preheat sufficient oil to fully submerge the cicadas. Mix 1 teaspoon salt and pepper (each), 1/2 teaspoon paprika, 1/2 teaspoon garlic powder, and 1 cup flour in a small bowl. Combine an egg and a tablespoon of milk in a separate bowl. Dip the blanched cicadas in the egg wash, then coat them in the flour mix and fry for two minutes. Sauted: Melt a pat of butter, two cloves of minced garlic, and a cup of fresh basil in a small pan. Add 30 or so cicadas and saute until they crisp up and the basil wilts. Serve over pasta. Adventurous eaters can find a variety of other recipes over at the University of Maryland newsdesk—from Cicada Stir-Fry to El Chirper Tacos.